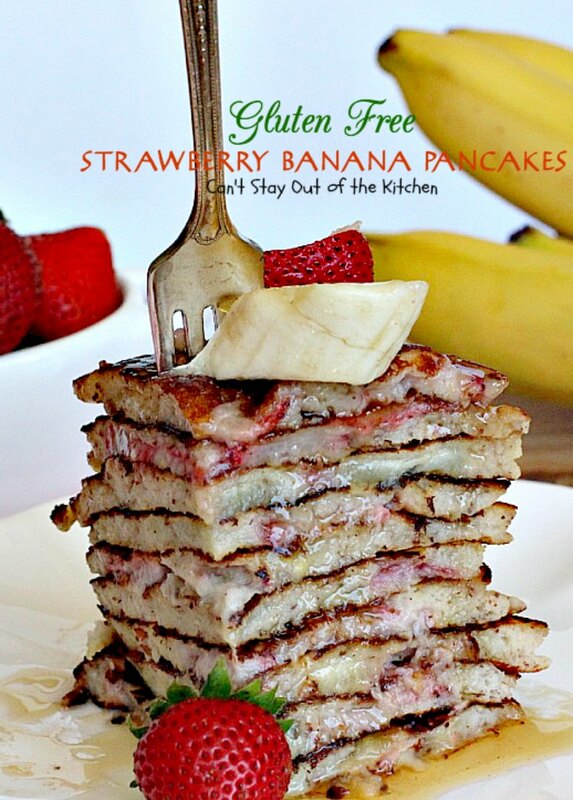 Gluten Free Strawberry Banana Pancakes are just mouthwatering. Are you ready for ANOTHER scrumptious pancake recipe??? These ones are so light and fluffy because I added buttermilk (soured milk) to the recipe. There are mashed bananas and sliced strawberries in the batter and then the pancakes are served with sliced bananas and strawberries — and real maple syrup of course! I was hungry for pancakes last week but after the Triple Chocolate Chip Pancakes (or death by chocolate), I decided I needed a healthier option. 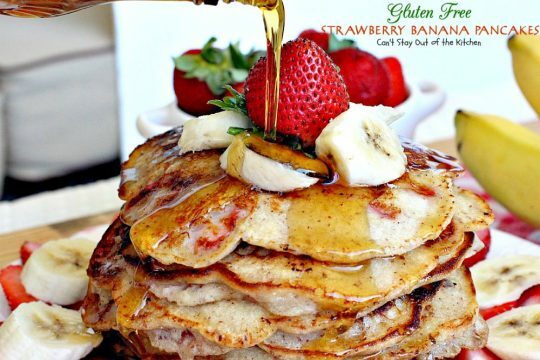 These pancakes have no sugar or artificial sweeteners. The sweetening comes from the fruit itself and maple syrup. Gluten Free Strawberry Banana Pancakes come with a lot less calories then my death by chocolate pancakes too! These pancakes have no oil in the batter either. 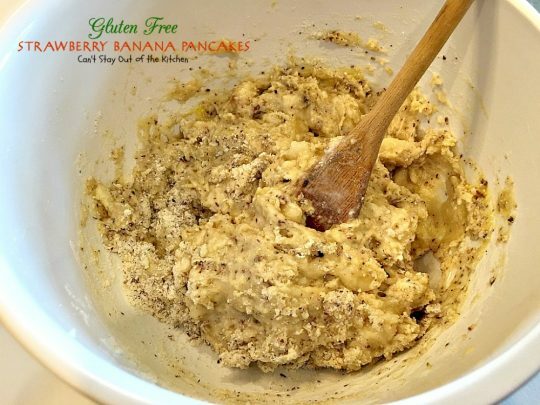 The mashed bananas take the place of oil making this recipe healthier than most pancake recipes. Gluten Free Strawberry Banana Pancakes are quick and easy to whip up. 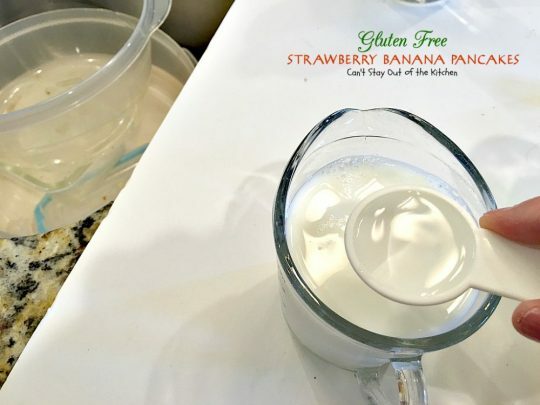 If you are dairy intolerant simply substitute almond milk for the soured milk in the recipe and eliminate the baking soda. I’m not sure the pancakes will come out quite as airy and fluffy but they should still turn out well. You will also have to find an alternative for the egg. 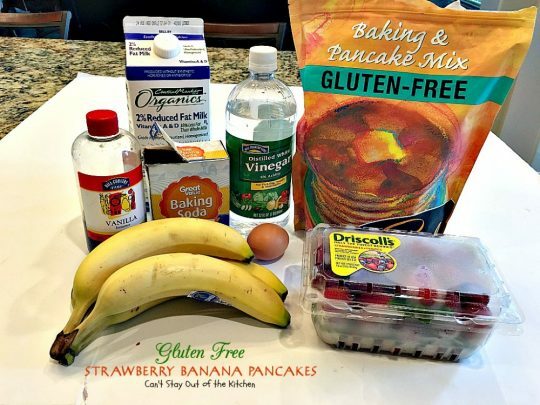 If you’re not gluten intolerant our favorite pancake mix is Krusteaz. These pancakes turned out so tasty. 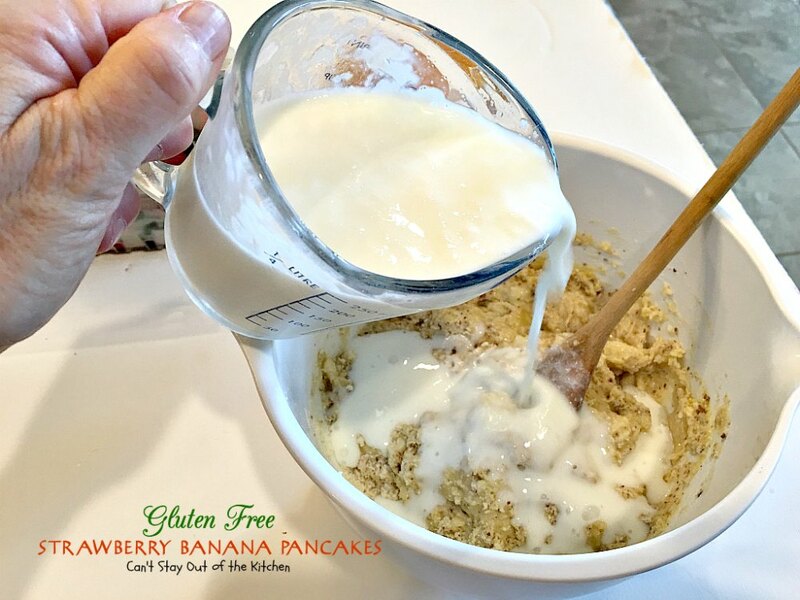 Strawberry-banana combinations are quite prevalent in everything from yogurt to cakes so I thought I’d try my hand at some in pancakes. I loved the result and I think you will too. 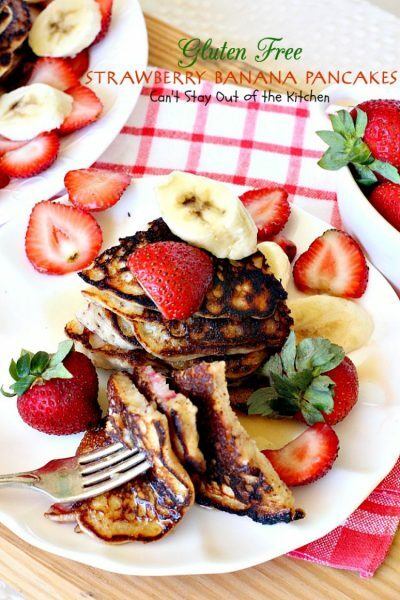 There are lots of delicious strawberries and bananas in every bite – plus you can eat some of your favorite foods without feeling guilty because these are a much healthier option than many pancake recipes. 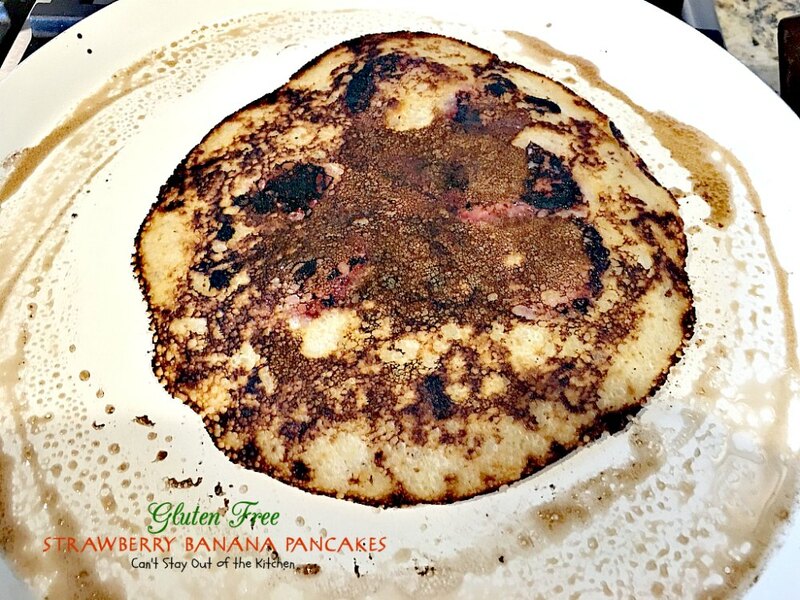 Gluten Free Strawberry Banana Pancakes are a healthy, low calorie, sugar free option for breakfast. 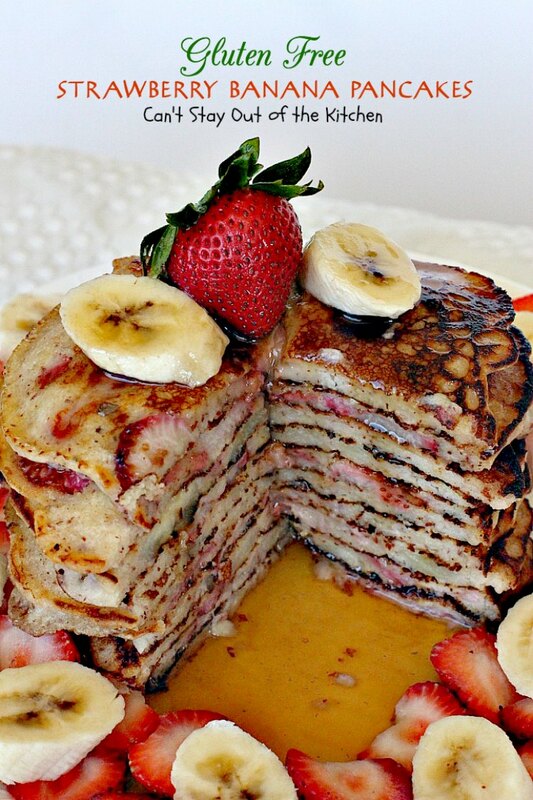 This close up view shows all the delicious strawberries and bananas piled on top of these pancakes. Juicy, succulent, delectable – and still part of a healthy breakfast! 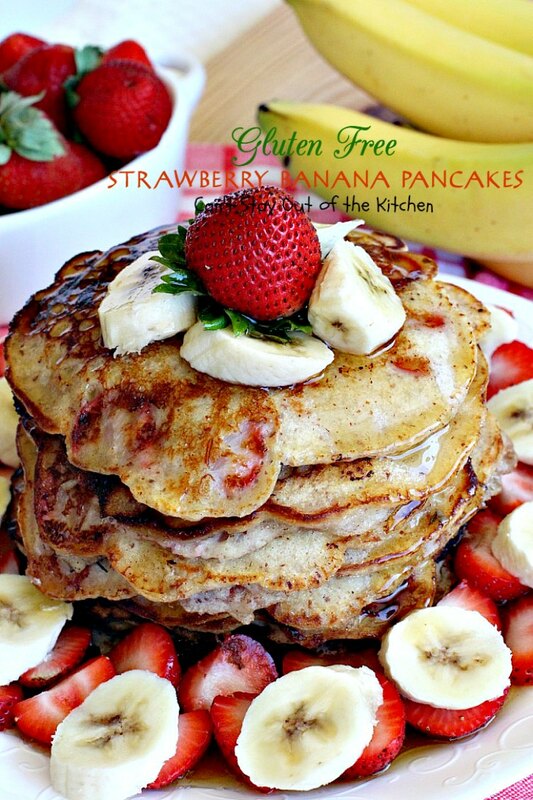 Gluten Free Strawberry Banana Pancakes is a wonderful option for a holiday breakfast. Add vinegar to regular milk and allow it to sit out about 3-5 minutes until mixture thickens and curdles. 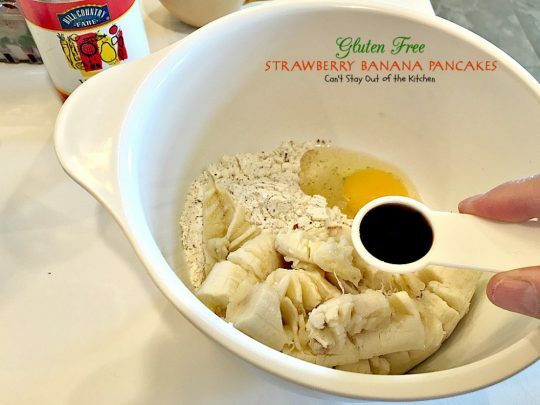 Meanwhile, measure gluten free pancake mix into a mixing bowl. Mash up two overly-ripe bananas. 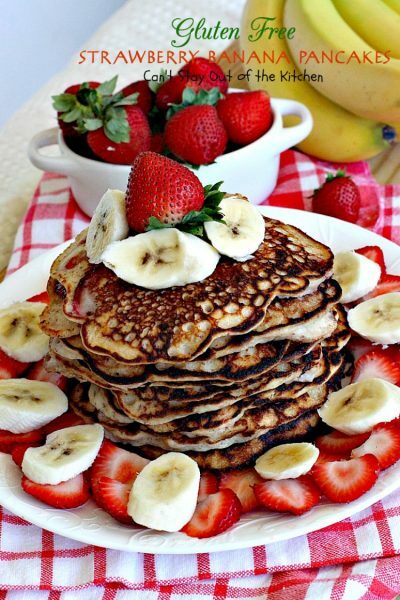 The riper the bananas, the sweeter the pancakes. Add vanilla and egg. Add baking soda to soured milk. The milk may foam slightly. Buttermilk when acted upon by baking soda as the agent gives a light fluffy air to breads, pancakes, cakes and other baked goods. Add soured milk with baking soda. 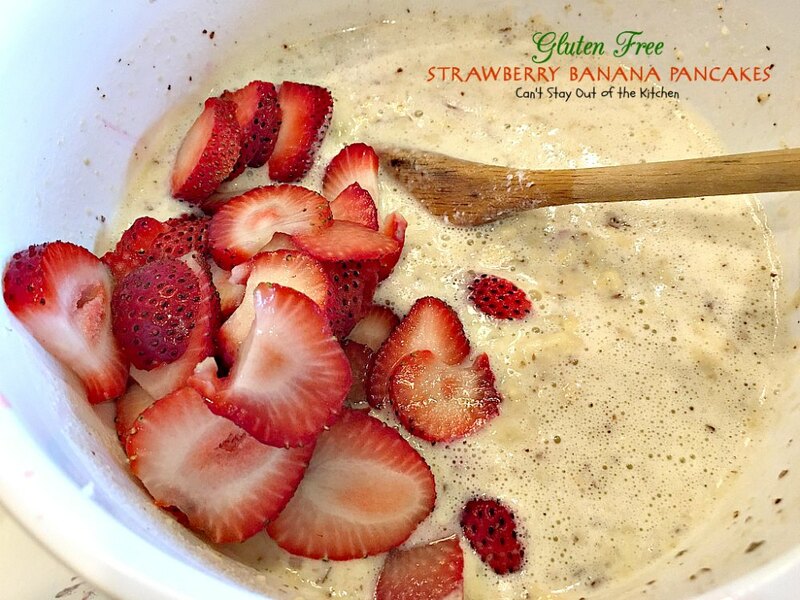 Add sliced strawberries and stir gently to combine. You can tell this mixture is a lot lighter and not as thick as some of my pancake textures. That’s partly due to the buttermilk and baking soda. Grease skillet with butter or coconut oil. Pour pancake batter into skillet or griddle. In this picture you can see the bubbles and holes forming on top. You don’t want to make the mistake of turning pancakes too early, then the batter drips all over and you can have a big mess on your hands. As you look at the edges of this picture you will see how the batter has a drier look to it. That’s where it has cooked through. When bubbles start to appear on the surface and you can see the outside edges are cooking through, flip the pancake over and cook the other side for a couple of minutes. Gluten Free Strawberry Banana Pancakes are a great option for breakfast or dinner. I couldn’t wait to dig into these delicious pancakes! Add maple syrup (so much healthier than regular pancake syrup made with corn). These pancakes can be whipped up in no time. They are a good start to a healthy breakfast for your family. Gluten Free Strawberry Banana Pancakes are some of the best you’ll ever eat. You may not be able to get through a stack this size, but this gives you a great idea of what the pancakes look like. Scrumptious buttermilk pancakes made with strawberries and bananas in the batter. 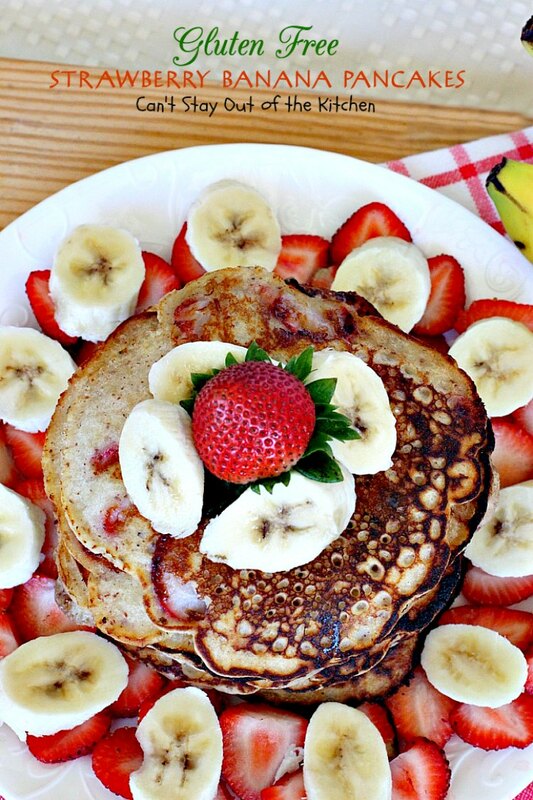 Garnish with real maple syrup, fresh sliced strawberries and bananas. This recipe is healthy, clean-eating, oil-free and gluten free. Pour milk into measuring cup. Add vinegar to milk and allow to set out on counter 3-5 minutes until milk thickens and sours. Meanwhile, place pancake mix in a bowl. Mash bananas and add to pancake mixture. Add soured milk and whisk to combine. Pour batter into heated, greased skillet or griddle (I used green pans which didn’t require oil). 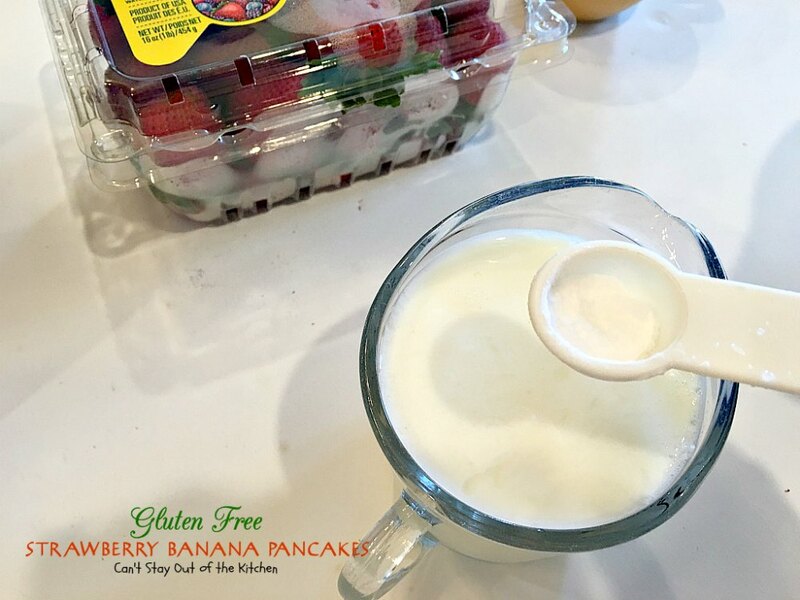 Allow batter to cook until bubbles form on top and the pancake is cooked ¾ of the way through. Turn pancake over and continue cooking until both sides are brown. Pour maple syrup over top. Garnish with fresh banana slices and fresh strawberry slices. Makes about 10 six-inch pancakes. 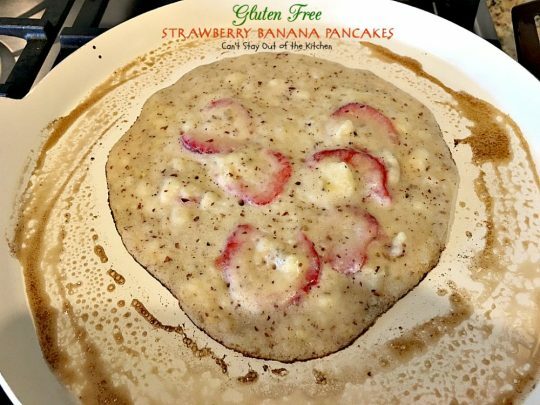 Gluten Free Strawberry Banana Pancakes require no oil which helps to cut down on calories and make this a lower calorie option. 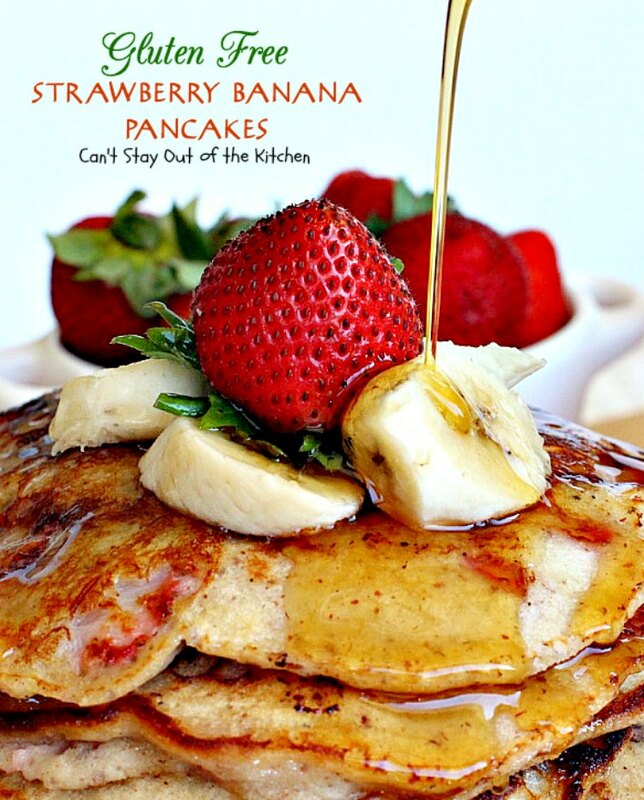 Garnish your pancakes with lots of fresh sliced strawberries, bananas and maple syrup. The pancakes were light and fluffy, not to mention scrumptious! If you’re looking for a gluten free option to eat one of your favorite breakfast entrees, then give these tasty pancakes a try! I received your e-mail update today. It must have worked when I resigned back up this morning. I am GLAD! 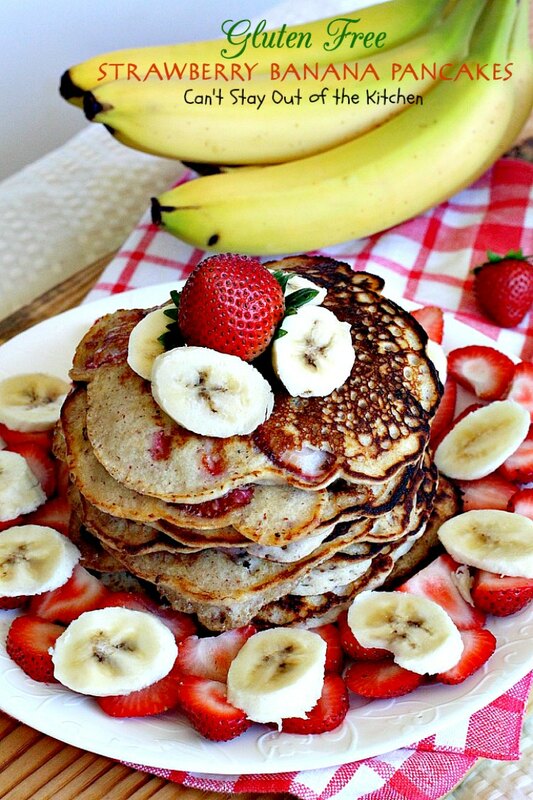 Your pancakes (I mean all of them look amazing)!! !m YUM! Great Job. Now, I will have to try these strawberry banana one too. My oldest daughter loves strawberry banana anything. My son said when he got everything switched over to our new blog host it should start working. I sent you an email about your RSS feeds. Hey, Diane, I did sign up for your RSS feed but it isn’t showing the featured pictured image in the feed. I’m not sure if there is something in your settings that needs to be clicked or what.